Lock in a great price for Hotel Doña Catalina – rated 8.5 by recent guests! Super friendly staff. Clean, comfortable, good location. A nice rooftop patio. We also liked the more authentic laid back feel of San Pedro. The attention is very personal, really approachable. I really love my stay! Staff were so friendly and helpful really went the extra mile! 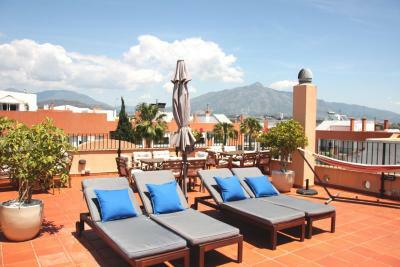 Location was perfect as were 5 min drive from peurto banus, would highly recommend! I liked that the housekeeping was very good and some of they was always smiling. From the moment I stepped through the front door, I loved this little gem of a place. I was warmly welcomed and greeted by both the gentleman who owned it and an extremely friendly professional receptionist. My only regret is that I did not find this hotel sooner as I make regular trips to the area and will be rebooking my next stay very shortly with my wife. Far too much quality food is my only complaint for breakfast as the standard was fantastic and the food plentiful. Those booking a stay here should also enjoy the peace and tranquility of the rooftop terrace equipped with loungers and hammocks etc. Cant wait for my next trip. Very friendly an genuinely helpful staff. They went out of their way to help me with my requests. Breakfast is very good value for money. There is no bar, but a refrigerator stocked with beer and wines which you can buy and have served on the roof terrace, where there is also a gas barbecue. There's nothing I didn't like about this place. Hotel Doña Catalina This rating is a reflection of how the property compares to the industry standard when it comes to price, facilities and services available. It's based on a self-evaluation by the property. Use this rating to help choose your stay! One of our best sellers in Marbella! This family-run hotel is set in a privileged spot in San Pedro de Alcántara center, a 20-minute walk from the beach and a 5-minute drive to Puerto Banus Marina. It offers a rooftop sun terrace. All of the rooms at Hotel Doña Catalina feature air-conditioning and include free Wi-Fi, flat-screen cable TV and a private bathroom. The hotel offers continental buffet breakfast every morning. There are also a number of bars and restaurants within 2 minutes’ walk. There are a number of golf courses, tennis courts and water sports facilities within a 10-minute drive of the hotel. The Atalaya Golf and Country Club is just 1.9 mi away and the Guadalmina Golf Resort can be reached by car in 5 minutes. 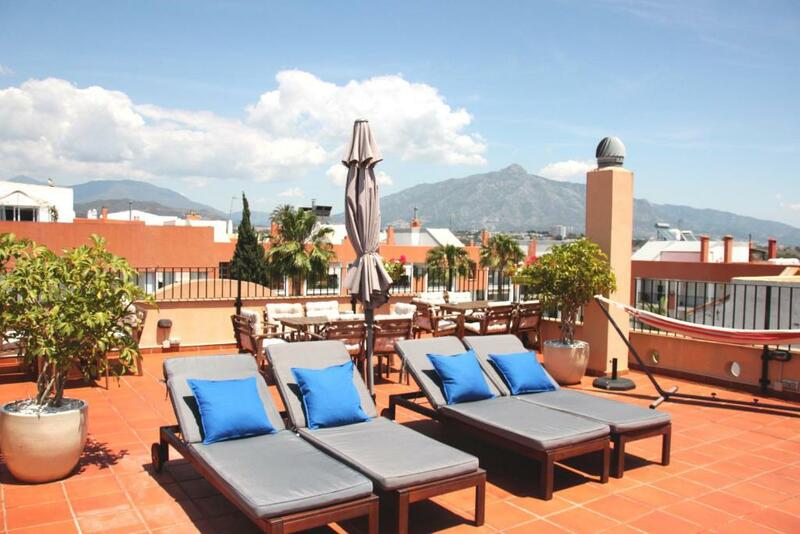 Malaga airport is a 40-minute drive from Hotel Doña Catalina. San Pedro de Alcantara is a great choice for travelers interested in the oceanside, nightlife and promenades. 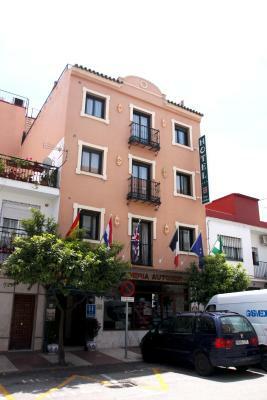 When would you like to stay at Hotel Doña Catalina? Air-conditioned room with a flat-screen TV with cable channels, desk and safe. The private bathroom comes with a hairdryer and free toiletries. Air-conditioned room with a 53 in bed, flat-screen TV with cable channels, desk and safe. The private bathroom comes with a hairdryer and free toiletries. Hotel surroundings – This neighborhood is a great choice for travelers interested in the oceanside, nightlife and promenades – Check location Great location - show map Guests loved walking around the neighborhood! House Rules Hotel Doña Catalina takes special requests – add in the next step! ATM card Hotel Doña Catalina accepts these cards and reserves the right to temporarily hold an amount prior to arrival. Hotel Doña Catalina accepts these cards and reserves the right to temporarily hold an amount prior to arrival. Room is very small and basic with weak make up, in 4days stay just once the change the towels, breakfast is very basic, not various, they don’t add during the breakfast time, so if you come later tan at 8:30 the breakfast bar is already empty. It is more like hostal or B&B category. Super nice staff, all of them! Clean rooms, good location, nice breakfast 😊 Absolutely worth the price! Lovely people, lovely balcony. Very comfy bed! The area avaible for parking is undergoing renovations and is therfore limited. It will probably be ready for the 2019 summer season. We were given a roof top room with private sundeck area, with a view over the town. The breakfast was buffet style and fresh. There is a cheap Syrian cafe nearby and some mid range restaurants. The centre was undergoing some renaovations out of seson which limited street parking options. Cooked breakfast for €6, sensational. Owner great fun and helpful. Location was a little far from the beach but only because my travelling companion was 77.
very central, reception staff very pleasant. Good loco not far from Alberto’s. And you have to eat there ! Nothing really. Towels a bit thin?